Staunton, June 12 – The violent clash between an individual gunman in a village near Moscow and members of the heavily armed Russian Guard, a clash that claimed the life of the gunman and left eight others, including four Guardsmen injured, have attracted widespread and almost ghoulish attention in the Moscow media. But they have also sparked two questions that are extremely inconvenient to the Russian authorities. On the one hand, some are asking, will increasing gun ownership spark an upsurge in violent crimes? (meduza.io/feature/2017/06/11/skolko-rossiyan-vooruzheny-i-vliyaet-li-eto-na-kolichestvo-sovershaemyh-prestupleniy). And on the other – and this is a far more serious worry for the authorities – given how hard it was for the well-armed Russian Guard to defeat a single gunman, some wonder what would happen if the forces of order were confronted not by one shooter but by “thousands”? Could the regime cope? (agonia-ru.com/archives/8548). Answering the second question is impossible: While there may be as many as 25 million guns in private hands, only about a third of which are registered with the authorities, there is no evidence the owners are united in ways that might lead them as a group to challenge the powers (windowoneurasia2.blogspot.com/2017/01/80-percent-of-25-million-guns-now-in.html). But the first question is one about which far more can be said with certainty, and Pavel Merzlikin, a Meduza portal journalist, provides some of the evidence one needs to draw conclusions. He notes that Russian Guard officials say that approximately 4.5 million Russians own guns that they have registered with the authorities and that each on average owns more than one (tass.ru/opinions/interviews/4138838). But the real numbers of guns in private hands are far larger, and some owners may now have a veritable arsenal. One reason for that is that ever more Russians are not registering their guns with the authorities because the cost of getting official approval has gone up by an order of magnitude, according to Igor Shmelyev, head of the Right to Own Guns organization. He says that in fact the number of people officially allowed to own guns has fallen from 5.2 to 4.5 million (ic.pics.livejournal.com/shmel_99/10098360/87226/87226_original.jpg). Most Russian gun owners are law abiding and use their guns either for hunting, target practice or personal defense, but the fact that ever more of them own the guns without having official registration is worrisome because it means that those lacking such registration have already broken the law and thus may be more willing to break other laws as well. And some are using guns in the commission of crimes. According to the Russian interior ministry, 5,000 crimes in Russia annually involve the use of guns; and this year, that number is on course to rise to more than 6,000, a 20 percent jump. In many cases,, the guns involved were not registered (http://tass.ru/proisshestviya/4328907). 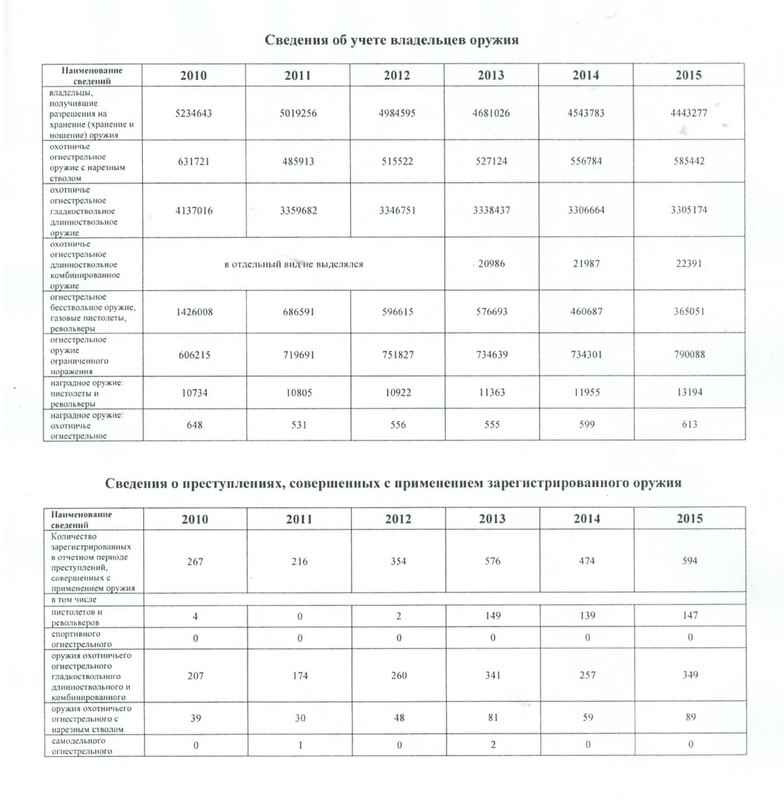 An interior ministry expert, Ivan Solovyev, says that the black market in guns has increased dramatically in recent years and that is likely to have an impact on crime as well (expert.ru/2016/06/14/oruzhie-stanet-esche-dostupnee/). He does not say but some of the weapons on this black market are likely bleeding into Russia from Moscow’s war in Ukraine. Consequently, it is not improbable that crime in Russia will become more violent and that the authorities, including the Russian Guard, will have to deploy ever more advanced weaponry to combat it and the challenge to public order and stability that such violence poses.